See photos and post-report from the 2013 event on the BHC Facebook Page. 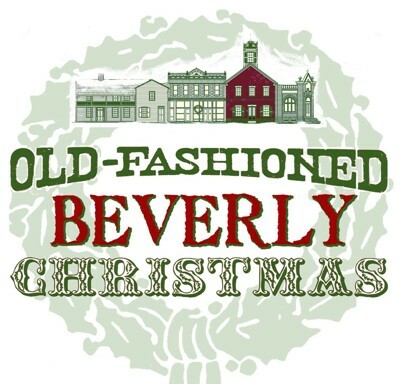 Historic Beverly will be kicking off the holiday season with an old-fashioned twist on Saturday, December 7, with activities and shopping opportunities happening at the Beverly Heritage Center and along Main Street from 10 a.m. until 5 p.m. Beverly Old-Fashioned Christmas features Victorian Santa Claus, over a dozen local artisans, traditional music and caroling, and a children’s coloring contest. Businesses around Beverly will be open all day, with new items in stock for the holiday shopping season. A holiday-themed children’s coloring contest will be a new feature to this year’s event. Entries can be completed at the Beverly Heritage Center from 10 a.m. until 12 p.m., with crayons provided. The top winner for the contest will be announced at 1 p.m. First prize is a youth-size BHC tee shirt, and every entry receives a treat. Victorian Santa Claus will also be in attendance to hear children’s Christmas wishes and pass out candy. Craft vendors will be set up around Beverly throughout the day showcasing their handcrafted wares for holiday shoppers. Vendors will be located in the Beverly Heritage Center gallery and across the street next to The Marketplace, in the Leonard’s Feed storefront. Handmade goods include woodworking, pottery, baked goods and candies, specialty breads, glass and beaded jewelry, soap, soy candles, and hand-woven textiles. In keeping with the historic theme and holiday spirit, the Beverly Heritage Center will also host the Mountain Winds woodwind trio of Richard Evans, Morris Kittle, and Linda Wolfersheim, who will perform traditional carols and Civil War era music at 10:30 a.m. The public is welcome to join organist Pamela Dodds and Beverly locals for caroling at 3 p.m. The Historic Beverly Antique Mall and Rusty’s Relics will be open showcasing antiques and collectables. The Marketplace and Cornucopia will feature a wide variety of gift items. Both the Beverly Heritage Center and Randolph County Museum will be open for museum viewing, as well as for book and gift sales.